Visual Astronomy: Your Name in Space! When NASA launches its Kepler space mission in February of 2009, they will be including a DVD disc on board the spacecraft. On this disc will be the names of people that have signed the disc, along with a message from that person. The Kepler mission will be put into orbit around the sun, with an orbital period of 372 Earth-days. The telescope will then drift into a further orbit about 1.5 AU from the sun. The telescope will be used to find Earth-like planets orbiting distant stars, potentially changing forever our views on life beyond Earth. So here's your chance to get your name and message into space for free. 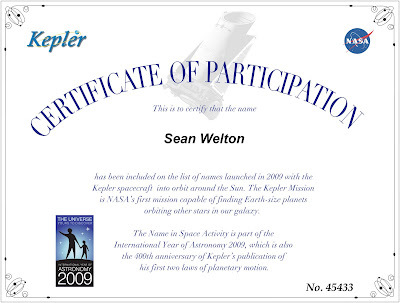 Just visit the Kepler Names Into Space website and fill out their form! When you fill out their form and submit your name, you will get a certificate to print acknowledging your contribution. My certificate is shown below. www.name2space .com is waayyyy beter.